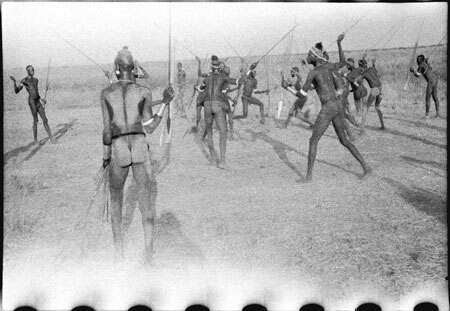 Youths thrusting spears at their mock opponents at a dry season cattle camp dance. The youth in the foreground and another beyond are wearing thiau armrings. Morton, Chris. "A Nuer dance" Southern Sudan Project (in development). 03 Jan. 2006. Pitt Rivers Museum. <http://southernsudan.prm.ox.ac.uk/details/2004.130.32952.1/>.